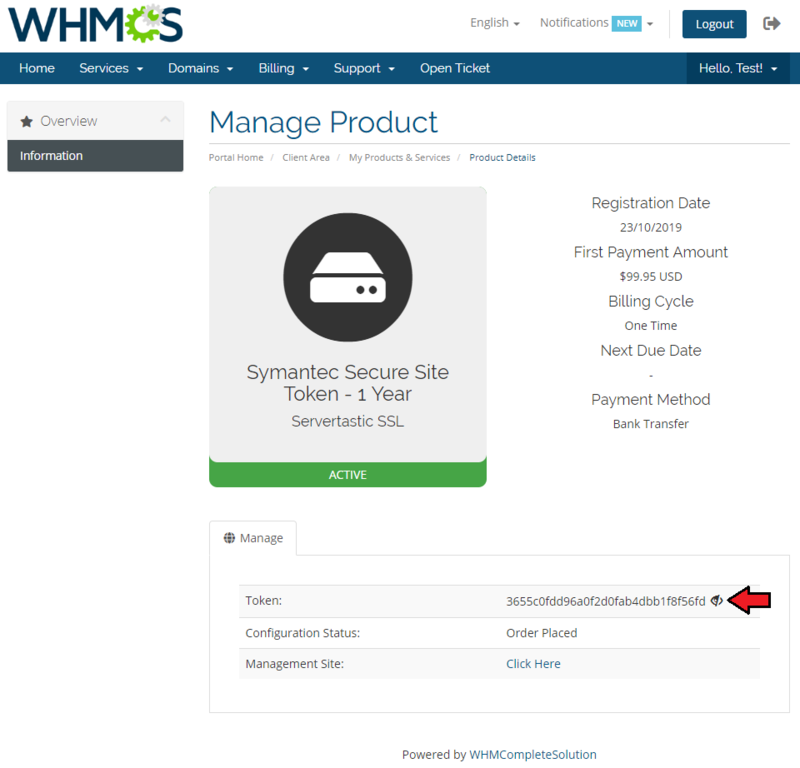 Servertastic SSL For WHMCS will allow you to sell tokens from your Servertastic reseller account that can be later on used to obtain certificates. 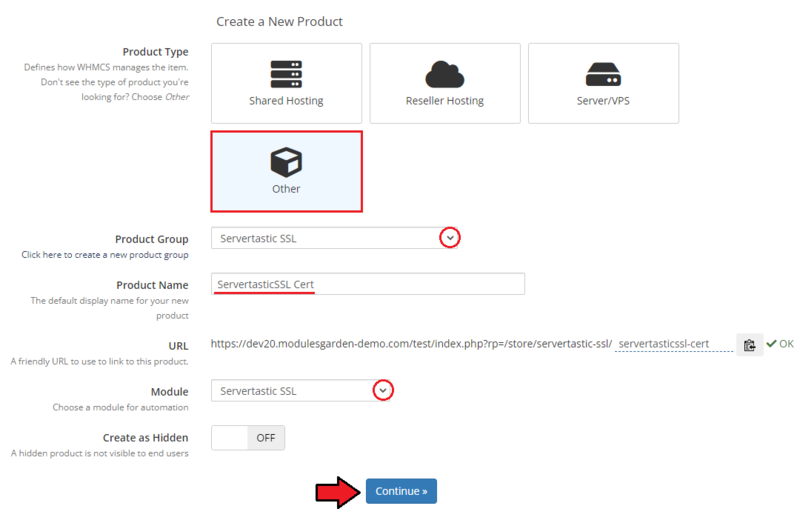 After receiving the tokens, your clients will be able to configure their certificates in either the Servertastic panel or Servertastic SSL For cPanel module. This tutorial will show you how to successfully install and configure Servertastic SSL For WHMCS. 1. 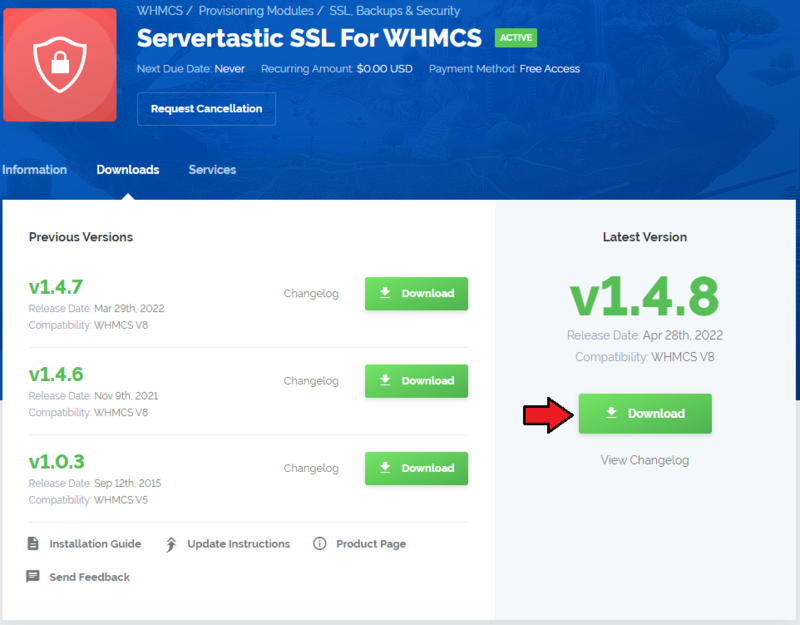 Log in to our client area and download Servertastic SSL For WHMCS. Files in your WHMCS directory should look like this. 3. In order to create and configure a product, go to 'Setup' → 'Products/Services' → 'Products/Services' . 4. 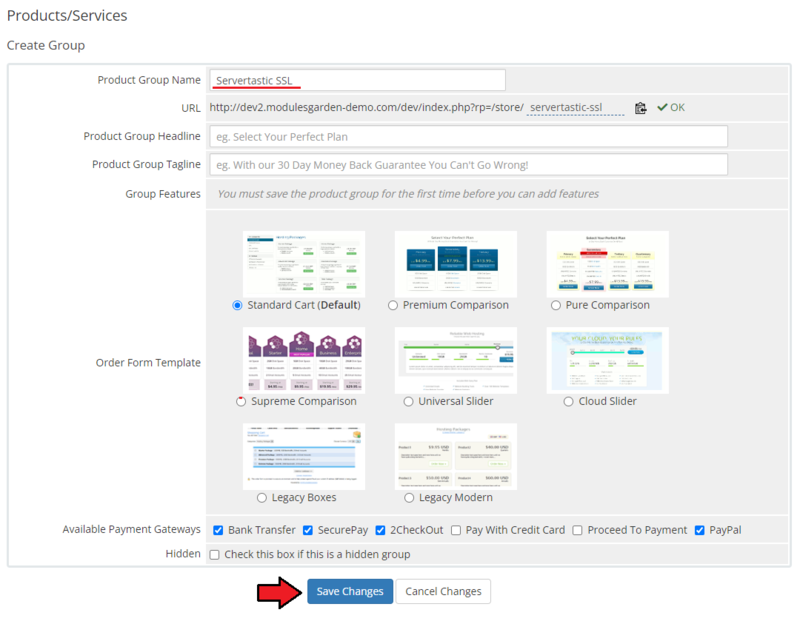 Enter product group name and press 'Save Changes' . 5. When you have a product group, you can create your product. To create a product, click on 'Create a New Product' . 6. Afterwards, choose your product group and type from dropdown menus, fill in your product name and press 'Continue' . 7. Now, go to the 'Module Settings' section, and choose 'ServerTasticToken' from a dropdown menu. Next, click on 'Save Changes' . 8. Finish by filling in 'API Key' and selecting the desired certificate type. Confirm through pressing 'Save Changes' . Congratulations! Your module is ready for use. Your WHMCS will now bill customers for the ordered certificates and generate tokens, which can be then used by customers to add their certificates in through Servertastic panel or through cPanel integration. After saving the settings in the 'Certificate Type' dropdown, available certificates will appear. Note: If you are using a test API key, first make sure that the 'Test Mode' option is enabled. SAN Values - enter how many domain names can be protected with a single certificate. Server Count - enter how many different servers can indicate the domains protected by a given certificate. Management Page Link - specify the address at which the customer will be able to see the generated certificate directly in the 'Servertastic' panel. Show Order Management Page link - select whether you want your customers to see a direct link to the certificate in the 'Servertastic' panel. Note: Make sure that SAN and Server vaules are supported by the selected type of certificate. You can find more relevant information on here. 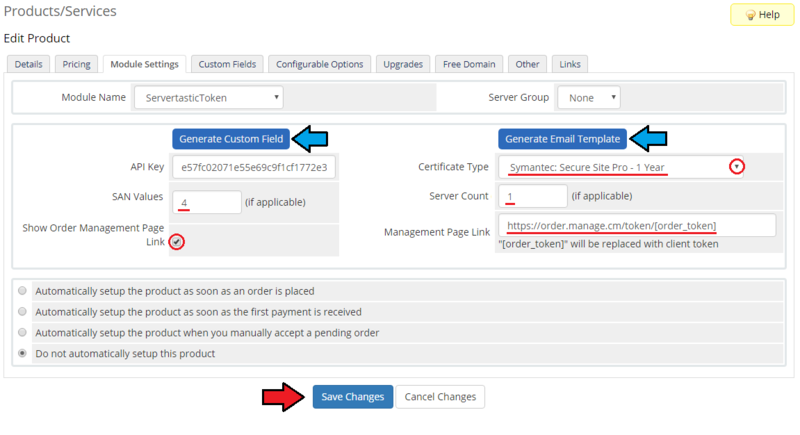 Finally, save the changes and do not forget to generate 'Custom Field' and 'Email Template' . 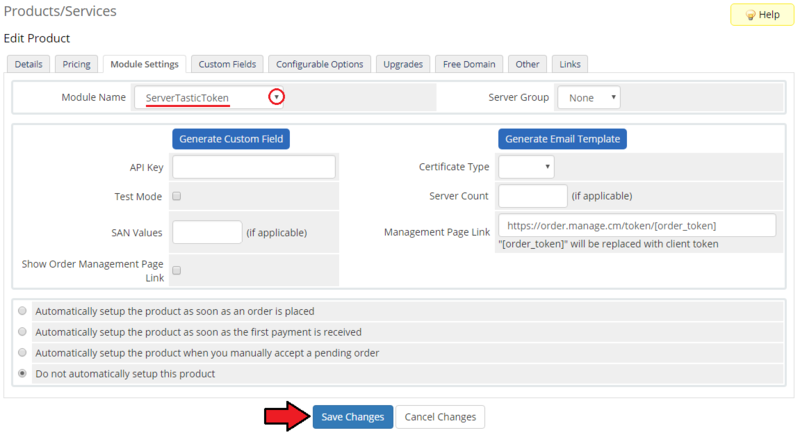 After placing an order for a configured product, the customer will have access to the generated 'certificate token' , its 'status' and a direct link to finish the order at the 'Servertastic' panel (if that option has been enabled). Optionally your client can copy the token and complete the certificate configuration directly in the cPanel. These steps are described on the Servertastic SSL For cPanel wiki. 1. Apart from the 'ServerTasticToken' , from version 1.3.0 there is no longer a direct support for the 'Servertastic SSL' module type. This is due to the removal of the existing API support that allowed this module to work properly. 2. When the certificate expires, a reminder will be sent to the customer to renew it. This will be done with the use of the main WHMCS cron and the 'Certificate Expiration Reminder' template. This page was last modified on 17 April 2018, at 11:20.